Stephanie M. Cardwell is a post-doctoral Research Fellow at the Australian Research Council Centre of Excellence for Children and Families over the Life Course in the School of Social Science. She received a B.S. in Psychology (2011) and a M.S. in Criminal Justice (2013) from the University of Alabama at Birmingham and a Ph.D. in Criminology (2017) from the University of Texas at Dallas. Her research predominantly involves testing developmental life-course criminology perspectives utilizing both quantitative and qualitative methods. 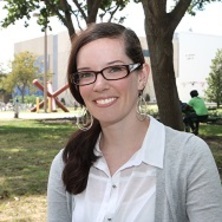 Stephanie is currently working on various projects utilizing data from the Ability School Engagement Program (ASEP), a randomized controlled trial of a third party policing initiative to address truancy in disadvantaged Australian adolescents. Journal Article: Does violence in adolescence differentially predict offending patterns in early adulthood? Does violence in adolescence differentially predict offending patterns in early adulthood? How well do the adolescent risk factors predict re-arrest frequency across race/ethnicity among serious adolescent offenders?